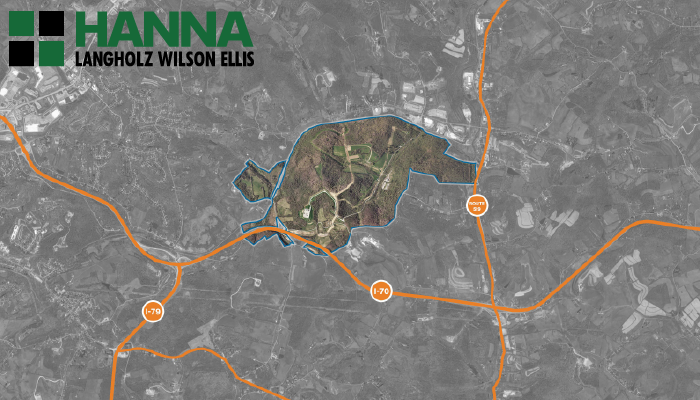 Pittsburgh, PA, September 26, 2018– Chairman of Hanna Holdings, Inc. Howard W. “Hoddy” Hanna, III has announced that Hanna Langholz Wilson Ellis is bringing to the market Zediker Station, a 1,200-acre, contiguous land site less than one mile from the junction of two interstates, I-70 and I-79 in South Strabane Township, Washington County, PA. This site has access to two Class I rail lines, CSX and Norfolk Southern. Public and private partners are in place and committed to the success of the development of this site. “The excitement around this project is palpable. There is great momentum behind it, which gives the community something to get excited about,” said Patty Horvatich, Vice President, Business Investment, Pittsburgh Regional Alliance, the regional economic development marketing affiliate of the Allegheny Conference. Regionally, this site is in a prime location; not only is it geographically located at the junction of two interstates, it is within 500 miles of 48% of U.S. businesses, 45% of U.S. and Canada populations, 63% of the national industrial output, 53% of U.S. buying income, and 40% of total U.S. retail sales. Southwestern Pennsylvania has 35 colleges and universities with more than 169,000 students enrolled on a yearly basis and more than 41,000 graduates each year. Additionally, Pittsburgh was just named the most livable city in the continental United States by The Economist Intelligence Unit. Jim Winter, Senior Director, Corporate Service & Commercial Brokerage and AJ Pantoni, Wilson Ellis Director of Industrial Brokerage, are the Hanna Langholz Wilson Ellis team representing CNX, the owner of the site. “This site represents a great opportunity for the region, as there are no other sites west of Scranton, PA as large as this site,” said Winter.